Sydney Harbour Bridge is international icon for Sydney and Australia. It is the widest and one of the longest steel arch bridges in the world. The bridge was planned in the early 20th century to span some 500m of harbour between the Sydney CBD and North Sydney, as part of a major upgrade of the Sydney city transportation network, which included the City Circle underground railway. The bridge was designed to take two rail lines from Wynyard Station in the CBD to Milson's Point in North Sydney - as well as six lanes of road traffic, two tram lines and a footpath on each side. After decades of argument and evaluations, onsite works started in July 1923, the main arch began in October 1928, and the structure opened for traffic in March 1932. 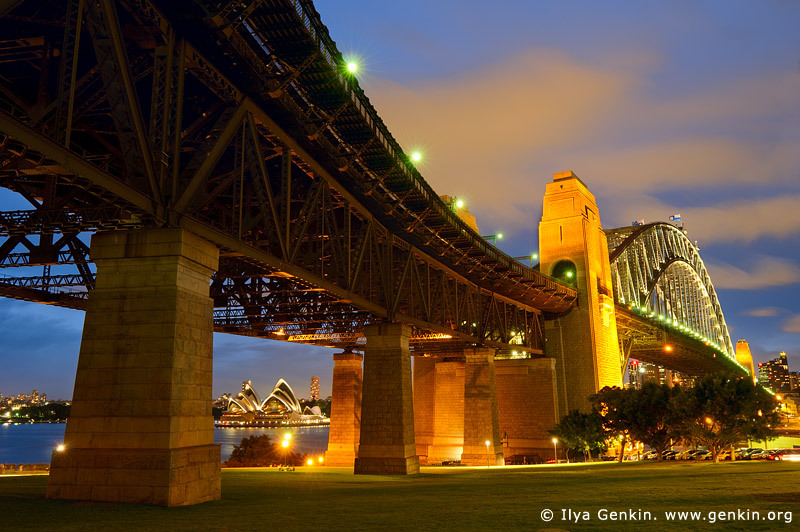 This image id AU-SYDNEY-HARBOUR-BRIDGE-0012 of Sydney Harbour Bridge at Night, is copyrighted © by Ilya Genkin. This is not a public domain image.